Fangirls, this movie gave me a fair few feelings I was not expecting it to. I saw it this past Wednesday, just 4 days after I returned home from the Most Magical Place On Earth, and I was really not expecting to get as into Tomorrowland as I did. The movie focuses on Casey Newton, a mischievous late teenaged girl who keeps making a mess of a NASA spot so her father can keep his job. One day, she gets caught, and when she’s bailed out of jail, a mysterious pin is in with her belongings. When she touches it, it transports her to another dimension, where there are people in jetpacks, monorails without the rails, and a whole slew of futuristic stuff. But it’s too good to last; just as she’s about to board a rocket ship, her time runs out and she’s thrown back into reality. Soon after, she meets a girl named Athena. Athena is a bit of a robot, literally. Her programming is to find people like Casey, dreamers, and get them interested in Tomorrowland, so that they can create a better tomorrow. But Athena has slightly altered her programming; she wants to bring Casey to someone named Frank, who can take them both to Tomorrowland. All sorts of absolutely crazy stuff happens as Casey, Athena, and Frank make their way to Tomorrowland, but I refuse to spoil it for you. Instead, I’ll leave you with this. 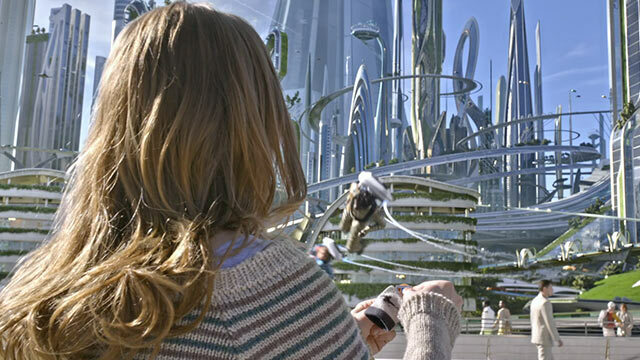 Go see Tomorrowland. See it for the uniquely Disney feel, the hidden Easter Eggs (I found a ton and I saw it once), and listen to that first song. The film opens in the 1949 World’s Fair, where Walt Disney premiered his “Carouse of Progress,” and the song, Great Big Beautiful Tomorrow, is what starts the movie off. That’s where those unexpected feelings showed up. See, when I go to a Disney film, I expect the Easter eggs. I expect the subtle hints and pieces of magic that are thrown in for Walt’s sake. But I wasn’t expecting this. Not only is Great Big Beautiful Tomorrow the opener, but it’s followed by Small World, and Tomorrowland looks a whole lot like how EPCoT was supposed to look; a city. So as much as Tomorrowland is a movie for everyone, it’s definitely aimed more towards the Disnerds, who are always on the look out for those hidden Easter eggs. Watch it, Fangirls, and let me know what you find!